After a couple days in Los Angeles we made our way to Santa Barbara. The city itself is called the American Riviera & for good reason - this little slice of heaven is like a piece of Europe in America. We were both so incredibly taken aback by the beauty of Santa Barbara & can't wait to make our way back because two days was just not enough! 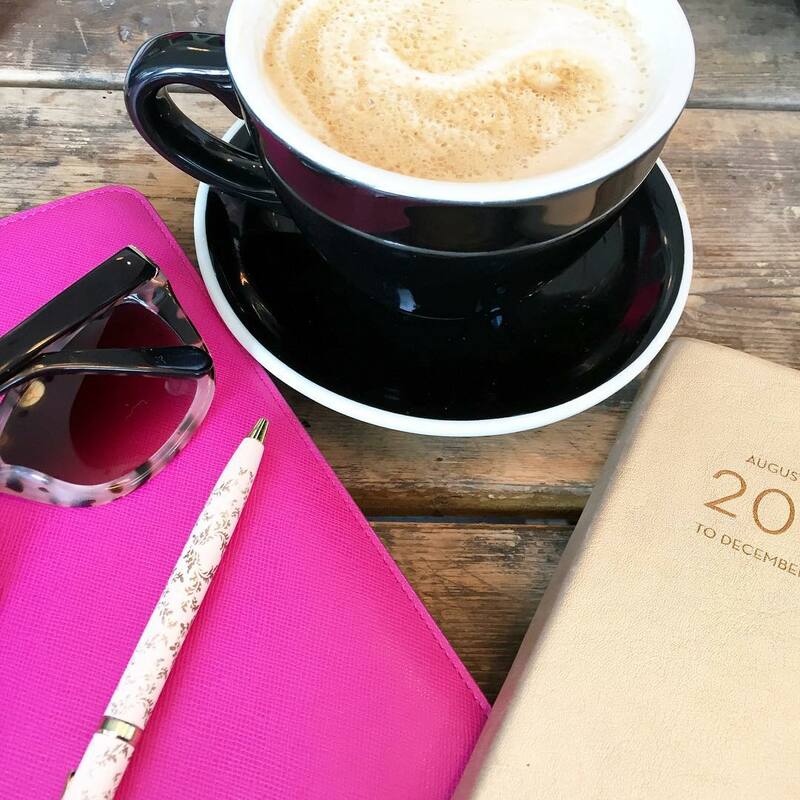 After doing a little research I stumbled upon an article from Lauren Conrad highlighting Hotel Milo as a great hotel for a trip to Santa Barbara. Situated right across from the beach, you are greeted by a friendly staff - hello complimentary happy hour from 4-6 pm every day, continental breakfast every morning, free wi-fi throughout the property & in your rooms & even fun bikes to take out for a day of exploring. For those of you that might remember - before leaving for California I didn't know how to ride a bike properly - I'm happy to report that I now know how to ride a bike & can't wait for warmer weather in Boston!! L'Occitane bath products - my hair never felt as silky as it did using their shampoo! We paid a touch extra to have parking included in our room rate which for the location was incredibly affordable. The best way to describe the hotel is coastal chic - when you're on a California vacation there is nothing better! 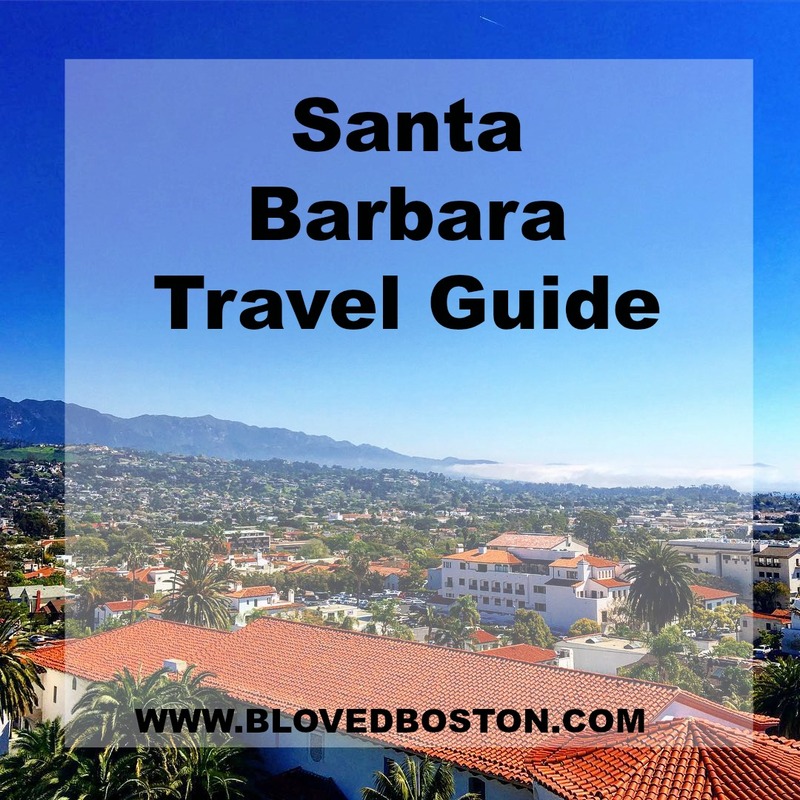 Aside from the beach, there are a few "must see" attractions in Santa Barbara - particularly the Old Mission & the courthouse that gives you views of the entire city - from the ocean to the mountains! Butterfly Beach & the waterfront are not to be missed. Enterprise Fish Co Hands down one of my favorite meals during our entire trip was at Enterprise Fish Co. We had the best, trust me I am not exaggerating since this is what they are known for, lobster bisque I have ever eaten. They have two locations - the Santa Barbara one is the original & it was easy to hop on Open Table to get a reservation. We talked about our dinner here the entire trip - it's must stop! The scallop risotto was also equally delicious. Santa Barbara Fish House If you're looking for a staple in the city, I'd say SBFH is the place to go. They have a great patio area with really nice views of the beach & if you time it right - you can be there during sunset & there is nothing quite as romantic as a sunset dinner. Great Pacific Ice Cream Co. Ice cream tends to be pretty delicious anywhere, but on a pier hearing the waves & seeing the sand is where I enjoy it most! We absolutely loved Santa Barbara and can't wait to go back. There were things that we didn't have enough time to do like the walking wine trail and exploring the vineyards around the area, but that just means we have to go back sooner rather than later! I know this was a rather long travel guide & I hope you enjoyed it! Next up...stops to make along the Pacific Coast Highway! Looks like an amazing place and also the food is yummy!! Santa Barbara sounds amazing!!! Your hotel looks lovely, and the hh, breakfast, wifi and bikes all sound like great amenities! Your food pictures look ridiculously delicious - I so want to go to Santa Barbara now! Santa Barbara has been on our list to visit for awhile and now I really want to go! Looks like the hotel was perfect and all the food pictures look absolutely delicious! Great guide, Biana! Absolutely looks like heaven on earth!! I think I'll extend our Vegas trip and hop over to Santa Barbara! So glad you loved it! And I would've chosen mint chocolate chip too, lol. Santa Barbara is one of my favorites - looks like such a fun trip! I always feel like I am flying by Santa Barbara and never have time to stop. I will change that next time because everything looks amazing!! Santa Barbara looks gorgeous!! Definitely somewhere I want to go one day! Santa Barbara looks seriously so gorgeous! That hotel looks like a dream too! What a fun and successful trip! Y'all take the best trips... I am putting Santa Barbara on my list of places to visit! And your hotel sounds amazing!!! oh my goodness, this looks amazing. santa barbara has never been on 'my list' - not in a bad way, just never really thought about it. now it is! that hotel looks fantastic, how cute are those bikes? i have ridden a bike once (in Versailles) in the last 10 years and it will probably be another 10 before I get on one again. Haha. coordinated I am not. that ice cream looks pretty fantastic as well. We loved Santa Barbara and wish we'd had more time to explore too! That hotel looks so cute! We loved Santa Barbara so much when we visited last summer! We spent most of our time on State Street eating and shopping!! You just can't beat those gorgeous views! I love visiting CA! I love that you got your hotel rec from Lauren Conrad! She can't steer us wrong! Beautiful pictures! 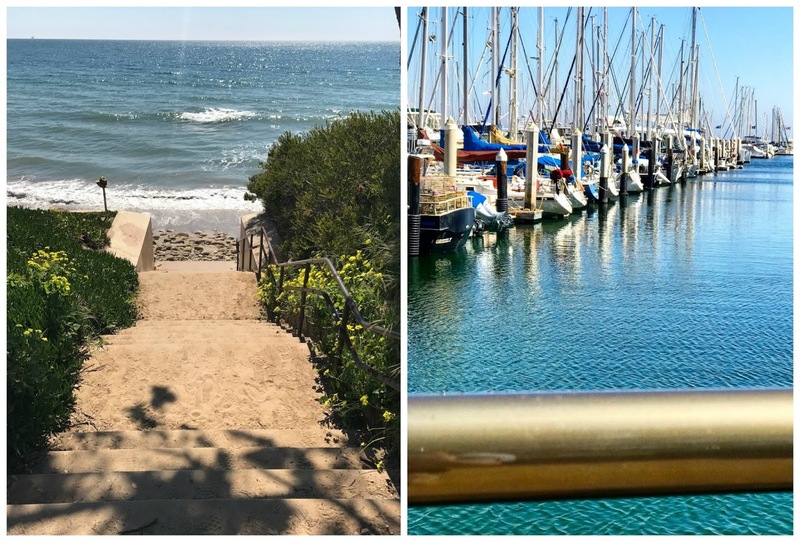 I've heard such amazing things about Santa Barbara, but never really seen photos or a review of a hotel there before, so I really enjoyed reading this post! It really does look like a slice of Europe, wow; it's absolutely gorgeous! I'll definitely have to make note to stay at Hotel Milo if we ever do visit because their amenities sound amazing and how cute and charming are their bikes! Speaking of, I'm glad you were able to learn and are excited to ride again when it warms up. I'm so rusty, I need to practice again because I used to be on the bike ALL the time as a kid and when I got on a few years ago, I nearly smashed into every single car I encountered, haha. 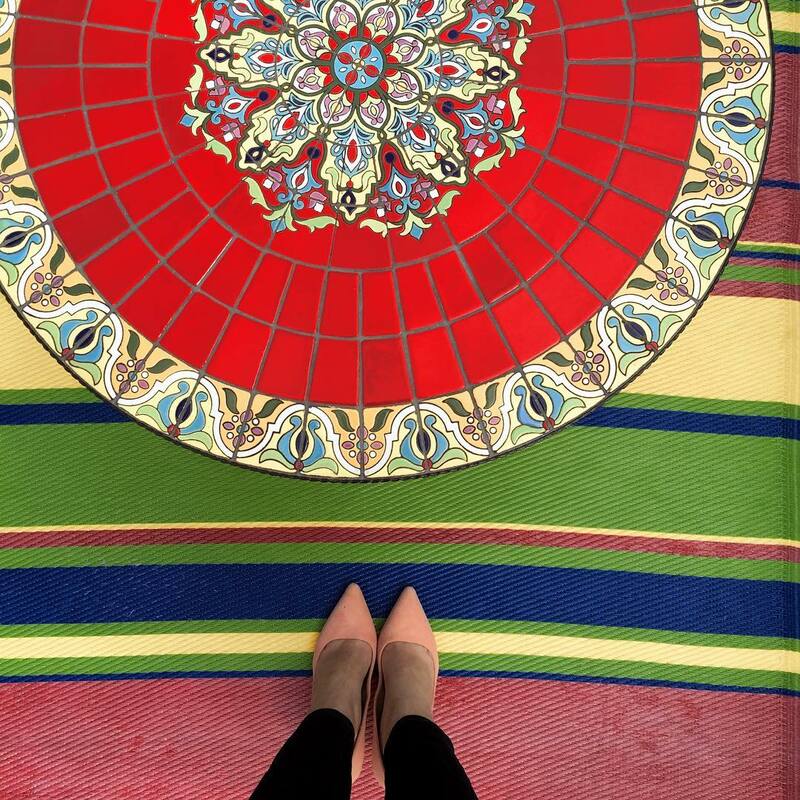 Thanks for sharing, beauty, and I hope you have the best week ahead! Saving this for future reference!! Your pics have me swooning and dying for a vacation! seriously never think about santa barbara when i think about cali and that is terrible bc it looks amazing! that hotel is super cute and love the bike option for getting out and about. and that water with the rocks - stunning! all of it. def adding to my list! Bicycles at the hotel, walking wine tour, gorgeous beach views... sounds like I need to plan a trip out to Santa Barbara soon! I LOVE Santa Barbara! It's such a unique place and so gorgeous! You have to do the wine trail the next time you go back, it is so much fun and the wineries are just an amazing experience with really great people working at them. We only got to stay one day in Santa Barbara on our trip, and both Russ and I were wishing we had longer because it was amazing. Loving your photos. Looks like you found the perfect hotel. Looks absolutely stunning! I have never been here and will be saving this for later! I am so glad you are a bike rider now! It is the best fun in nice weather. SUCH gorgeous pictures. That sunshine is calling my name!! ;) One of these days I'll make it out to the West Coast haha, and I'll be for sure bugging you for more info when that times comes! My husband and I are driving the California Coast for our honeymoon in May and our first stop is Santa Barbara and I had already book Hotel Milo :) So glad to know it was a good choice! Thanks for the recommendations on food and things to do, Ill definitely be using some of those! This whole trip looked amazing - and love these photos from Santa Barbara! Oh - and loving that ring in your ice cream picture! The only city in California I've been to is LA- but there are so many others on my list! Certainty will be adding your recommendations- Santa Barbara looks amazing! You must have had amazing time. these pics are beautiful, and the food looks so yummy. Ohhhh my goodness. This looks MAGICAL! I need to visit! Y0ur pictures make me want to be there right now!!! Especially the view of the whole city basically. Breathtaking! And that meal!!! All those food pictures have me drooling over here. A walking wine trail sounds like a great reason to walk. LOL. Hopefully you will get to go back and do that! I love that the hotel had bikes. What an awesome little extra. I've never been to Santa Barbara and it looks gorgeous! How fun that the hotel had bikes! This definitely makes me want to plan a trip there! Such a fun trip, Biana! I'll just live vicariously through you, especially when you travel! Glad you two had a good time, y'all deserve it! Visiting Santa Barbara is high up on our list for one of our California visits - it looks like you guys had the best time! Everything looks so pretty and peaceful! I'm already pinning this for later - it looks like the cutest little California town! You guys saw and stayed at some beautiful places. I bet lots of great eats, restaurants and bars too. Such gorgeous photos and great tips. Love your tie-dye maxi skirt, B. Come linkup with me this Thursday, Beautiful! I love trips to Santa Barbara and this post makes me want to go there again. I love the toiletries they included. Those are the best!!! Wow! Take me now! I seriously have to make it a point to get out West! Oh wow Biana, the whole trip looked so amazing, but these views are incredible. The hotel sounds perfect, and YAY to bike riding! Go girl! I'm so happy you learned how to ride a bike!!! Those views look gorgeous and it is definitely on the list of places I want to travel to! I've never been to Santa Barbara, but this post is making me want to visit so very badly! It looks so beautiful, and I'd definitely be all for those wine trails too! Congratulations on your new bike riding skills! What an amazing place - I would love to go to Santa Barbara. I just love all the views. This is such a great guide and recap! The food alone makes it look worth the trip :-) hope your week is off to a great start! Looks like you guys had such an amazing time! Loved this recap! Santa Barbara has been on my list forever, and I was bummed it barely missed the cut on our last trip to California! I think it's a must for the next time we go! My family vacations every summer in Santa Barbara, one of my favorite places ever! This travel guide is so awesome, and I'm loving all the beautiful photos! I really want to visit Santa Barbara now! I shouldn't have read this while I am starving haha! That food looks amazing!!! I would love to visit Santa Barbara! It looks gorgeous! Santa Barbara looks gorgeous and sounds like you got a gem of a hotel! I love when it comes with breakfast and happy hours are a nice bonus too! Other than San Francisco and Sonoma Wine Country, I haven't been anywhere else in Cali so I'm going to live vicariously through your fun PCH recaps until we can make our way over there to explore the coast! Ive been DYING to go to Santa Barbara and your pictures just confirmed that I definitely want to go there soon! I LIVE for a good lobster bisque! That sounds amazing! I so want to visit Santa Barbara. It looks amazing. So glad you had a great time! I was loving your Insta stories while you were in SB- everything is so gorgeous! Makes me want spring + summer STAT! I can't get over how picturesque everything looks, and all of the food... yum! You guys got so many great pictures and I can't wait for the next trip recap. I've never eaten ice cream on a pier or beach. I need to do that sometime, since I live closer to a beach now! Beautiful pictures. Oh, those views! So gorgeous - I def want to visit someday! Back from Vacation & Favorites!